I hope this sermon was not a snore. It is one of those that I think is operating at a very simple level, but also I hope operating at a much deeper level. The very simple level is: a problem, a solution, and a wait. This world wears away. Good news, it will end. Until then we watch, never becoming too attached. The deeper level is the juxtaposition the title. Today, this world is an impermanent dwelling that holds within it the permanent. The core of many of the temptations of the devil, the world and our own flesh is that we trade that eternal element for some promise of immortality. I will give you all the kingdoms of the world if you worship me. The glory and fame of all the world can be yours, if you give up eternity, seeing the true God. 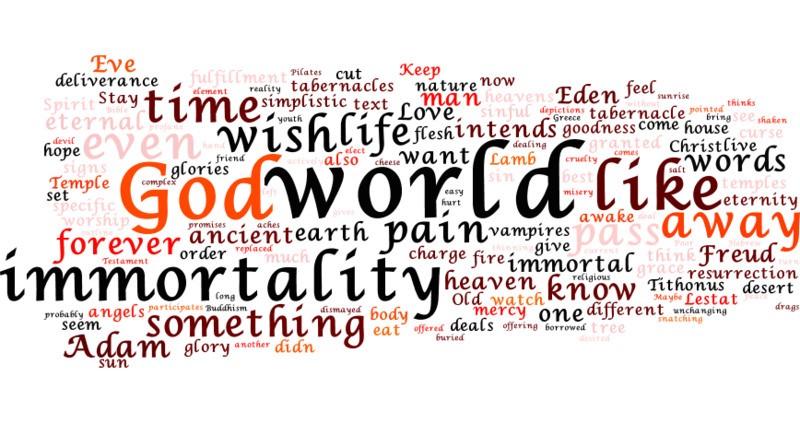 The sermon attempts to think about this in our vampire stories – the literary example of immortal characters who are caused pain by the eternal or things that contain hints of the eternal. 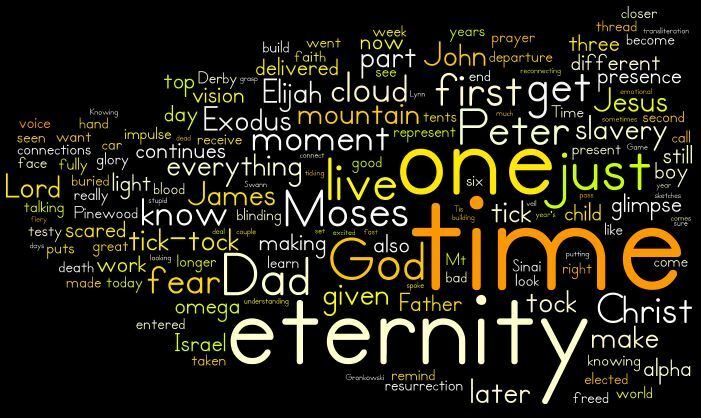 I think there is a great and fruitful contemplation in that juxtaposition of eternity and immortality. We watch because we are looking for eternity while spurning the flimsy offers of immortality. Today was Transfiguration Sunday which is the last Sunday in the Season of Epiphany. Lent Begins mid-week with Ash Wednesday. Transfiguration to me is a tough preaching assignment because it is fundamentally a visual experience. Parables are about words. Miracles are just as often about reactions to the happening. Both of those are easily pondered and preached in words. But with the transfiguration, it is an icon. What I mean by icon is that it is a picture that invites you to ponder fundamental reality, to contemplate and enter eternity. What this sermon chooses to ponder of that reality to time. We live, especially we moderns live, in a culture that at a minimum emphasizes tick-tock time. It sometimes goes as far as to deny there is anything but. But all icons are invitation to see beyond or underneath that press of the everyday. The transfiguration as the ultimate icon invites us to see all of eternity in one moment. The alpha and omega present on a mountaintop. The sermon moves from the lessor to the greater. It posits hopefully a couple of more common icons in our lives that telescope time into an icon. Then it moves to the transfiguration. Finally it moves on to the demands and promises of knowing any icon. The what I put it here is that knowing eternity, we are freed to live in the moment. Not for the moment or obsessed with tick-tock time, but fully present in it. We are so freed to be truly present in good and ill because we are part of Jesus exodus. In Christ our time has been redeemed, reconnected to eternity. We have eternity, so we are free to enjoy time. Worship note. Can I share a pet peeve? I understand the point of copyright. I believe that musicians and composers need to get paid. But copyright just kills the culture of hymns and sacred music. Here is what I mean. Today as a close we sang Lutheran Service Book number 416 – Swiftly Pass the Clouds of Glory. It is a very modern song. The text is copyrighted 1994; the tune (Love’s Light) in 2000. To me this hymn is one that I’d put in the list of all time greats that every Christian should know. Think Amazing Grace or A Mighty Fortress. The tune is gorgeous, contagious and singable. The words are deep, emotional and challenging. And part of the magic is that they fit together. That is a hymn that should be shared. I can’t. It’s copyrighted. Church music, like preaching, isn’t really a commercial endeavor. You do it for the good of the church. Ah, thoughts on the staircase. It stuck me as I was completing the upload that the OT does have a lesson. In learning the very basics of being the children of God, Israel dwelt in tents. Those tents came down and went up at the command of the Lord at unknown times. Being the people of God requires living in certain dwelling lightly. The graceful practice in the church is not always going to look the same. Not talking about the eternal law, or the Word which abides forever, but about how we live it or incarnate it.